Different units of neurons or ‘neural ensembles’ (Eichenbaum, 1993) within a single brain area selectively react to different environmental cues, as shown by electrophysiological and calcium imaging studies (e.g., Schoenbaum et al., 1998; Jog et al., 1999; Frank et al., 2000; Ohki et al., 2005; Komiyama et al., 2010). Such ensemble-specific brain activity is thought to function as the memory engram, each representing a unique learned association between environment and behavior (Cruz et al., 2013; Mayford, 2014; Tonegawa et al., 2015). Based on the correlational evidence from electrophysiological and calcium imaging studies, it is commonly thought that multiple engrams concurrently exist within a single brain site at a single stage of learning. Previous studies have established the causal evidence that a single brain area (Warren et al., 2016) or ensemble (Redondo et al., 2014) can represent two different engrams at two different stages of learning (e.g., before vs. after extinction training). However, the causal evidence supporting the concurrent existence of multiple engrams within a single brain site, each mediating different environmental actions on a learned behavior (e.g., a go/no-go task), is still lacking. Here we present the causal evidence for the concurrent existence of two distinct engrams within the infralimbic cortex (IL) of rats, each mediating opposing environmental actions on a pre-established operant response. Our findings help reconcile the contradictory reports regarding the role of IL in the environmental control of appetitive behavior (Gourley and Taylor, 2016). Some reports (Koya et al., 2009a; Bossert et al., 2011) indicate that non-selective disruption of IL, irrespective of neural activity, prevents promotion of reward seeking by cues signaling reward availability (e.g., reward contexts). However, other reports (Peters et al., 2008; LaLumiere et al., 2012) indicate that non-selective disruption of IL prevents suppression of reward seeking by cues signaling reward omission (e.g., extinction contexts). Yet other reports (Willcocks and McNally, 2013; Pfarr et al., 2015) indicate that the non-selective disruption of IL has no significant effect on either promotion or suppression of reward seeking. These discrepancies could be the results of different IL neurons selectively reacting to different cues signaling reward availability and omission. We hypothesized that distinct neural ensembles – concurrently existing within IL but each selectively reactive to a discriminative stimulus predictive of reward availability (S+) or omission (S-) – differentially control promotion and suppression of reward seeking. To test this hypothesis, we developed an animal model for bidirectional environmental modulation of reward seeking, and utilized a neural activity-targeted disruption technique (Daun02 pharmacogenetic inactivation in Fos-lacZ transgenic rats) (Koya et al., 2009b) to inhibit neural ensembles in IL specifically activated by either S+ or S- cues. All rats were trained to recognize three sets of cues predictive of rewards at varying probability: active lever and light-cue (50%), S+ (100%) and S- (0%). All rats were trained to lever-press for a sweet solution (containing 3% glucose and 0.125% saccharin) presented together with a light-cue (Figure 1A), and further trained to recognize distinct auditory cues (white noise and beeping tone) as S+ and S- (Figure 1B). 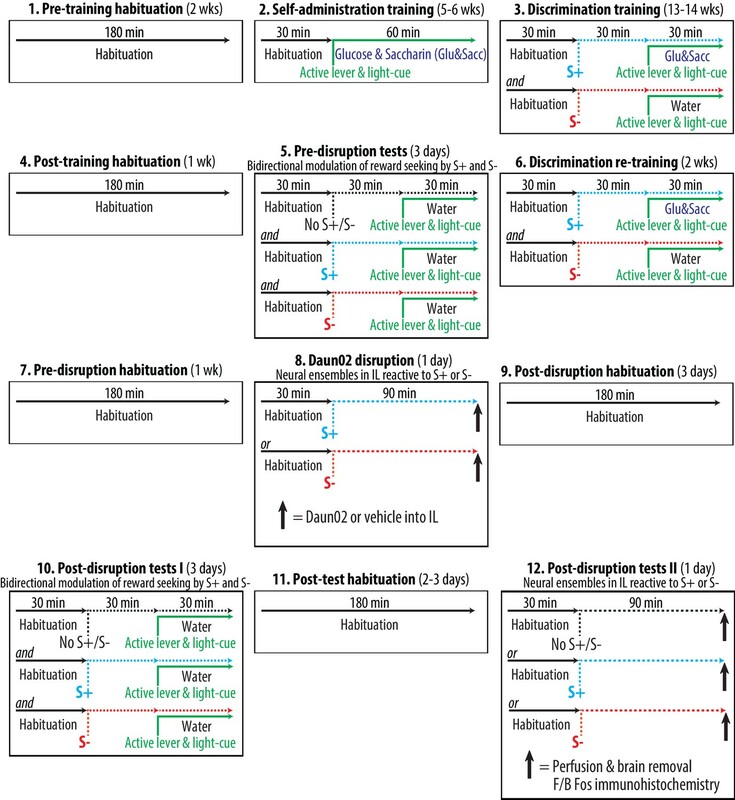 Each rat underwent three cue-tests (Figure 2A) for bidirectional environmental modulation of reward seeking: (1) active lever and light-cue without S+ or S- (‘No S+/S-’), (2) active lever, light-cue and S+, (3) active lever, light-cue and S-. Glucose and saccharin were not available during these tests. One-way analysis of variance (ANOVA) on active lever-pressing revealed a significant effect of cue-test (F(2,89) = 216.679, p<0.001). The active lever and light-cue sufficiently initiated and maintained lever-pressing (see No S+/S-). In each animal, superimposing S+ significantly potentiated lever-pressing (p<0.001), while superimposing S- significantly suppressed this behavior (p<0.001). This bidirectional environmental modulation of reward seeking is presumably mediated by learning processes known as ‘conditioned excitation or inhibition’ (Rescorla, 1969) or ‘positive or negative occasion setting’ (Schmajuk et al., 1998). (1A) Self-administration training to establish operant response for a palatable reward. The rats were subjected to once daily operant conditioning sessions (60 min, each) to press an ‘active lever’ for the purpose of gaining a sweet solution (3% glucose and 0.125% saccharin dissolved in water). Each delivery of the sweet solution was paired with a ‘light-cue’. Presses on an ‘inactive lever’ were without a scheduled consequence. Each rat was required to satisfy preset training criteria, and underwent a total of 35 to 42 sessions. Group means of the total number of lever presses per session (±SEM) during the first and last 10 sessions are depicted. During this phase, both active lever and light-cue predicted the availability of sweet solution 100% of the time. N = 90. (1B) Discrimination training to establish two distinct auditory cues (white noise and beeping tone) as the discriminative stimuli predictive of reward availability (S+) and omission (S-). Each rat was subjected to alternating once daily operant conditioning sessions (30 min, each) to press the active lever for the purpose of gaining the sweet solution (preceded and accompanied by the S+ auditory cue) or plain water (preceded and accompanied by the S- auditory cue). Each delivery of either sweet solution or water was paired with the light-cue. During this phase, each experimentally manipulated stimulus was conditioned to predict glucose and saccharin at the following probabilities: active lever and light-cue (50%), S+ (100%) and S- (0%). Each rat was required to satisfy three preset training criteria, and underwent a total of 92 to 98 sessions (46 to 49 S+ sessions and 46 to 49 s- sessions). Group means of the total numbers of lever presses (±SEM) recorded during the first and last 10 sessions are depicted. N = 90. (2A) Pre-disruption tests for the bidirectional modulation of reward seeking by S+ or S-. Each rat was subjected to three once daily cue-test conditions (30 min, each): (1) active lever and light-cue without S+ or S- (No S+/S-), (2) active lever, light-cue and S+, (3) active lever, light-cue and S-. Under all cue-test conditions, a press on the active lever delivered water and illuminated the light-cue. The sweet solution was not available. Group means of the total number of active lever-presses under each cue-test condition (+SEM) are depicted. N = 90. *p<0.001 (vs. No S+/S-). (2B) Daun02 disruption for the activity-targeted inhibition of neural ensembles in IL reactive to S+ or S-. The rats were randomly assigned to one of four experimental groups defined by the type of disruption cue (S+ or S-) and microinjection (Daun02 or vehicle). The rats were exposed to S+ or S- (90 min), and then received a bilateral microinjection of Daun02 (2.0 µg/0.5 µl/side) or vehicle (0.5 µl/side) into IL. In order to disrupt neurons specifically activated by S+ or S-, both active lever and light-cue were withheld (‘No active lever/light-cue’). Representative sites of microinjection are depicted. (2C) Post-disruption tests for the bilateral modulation of reward seeking by S+ or S-. Each rat was subjected to three once daily cue-test conditions. The experimental schedule effective during the Pre-disruption tests (2A) was applied. Group means of the total number of active lever-presses under each cue-test condition (+SEM) are depicted. N = 21–24, each. *p<0.01–0.001 (vs. No S+/S-). The rats were then randomly divided into four groups defined by disruption-cue (S+ or S-) and microinjection (Daun02 or vehicle) for neural activity-targeted inactivation (Figure 2B) using previously established procedures (Koya et al., 2009b; Bossert et al., 2011; Pfarr et al., 2015). Each rat was first exposed to either S+ or S-, and then received a bilateral microinjection of Daun02 (2.0 µg/0.5 µl/side) or vehicle (0.5 µl/side) into IL. In Fos-lacZ rats, Daun02 (inactive compound) is catalyzed into daunorubicin (cytotoxin) by beta-galactosidase (enzyme) only in ‘activated’ cells expressing Fos (activation marker), thereby triggering apoptosis (see Pfarr et al., 2015). In contrast, Daun02 cannot be catalyzed into daunorubicin in ‘non-activated’ cells lacking Fos expression (and thus beta-galactosidase), and cellular disruption is prevented. As such, Daun02 selectively inactivates Fos-positive ‘activated’ neurons without disrupting the surrounding Fos-negative ‘non-activated’ neurons. On the day of Daun02 disruption, both active lever and light-cue were not introduced. Thus, the rats were withheld from lever-pressing, as to not disrupt neurons activated by either active lever or light-cue. Each rat then again underwent the three cue-tests for the bidirectional modulation of reward seeking by S+ or S- (Figure 2C). Three-way ANOVA on active lever-press revealed significant effects of disruption-cue (F(1,86) = 8.839, p<0.01), cue-test (F(2,172) = 313.899, p<0.001), and significant interactions for disruption-cue and microinjection (F(1,86) = 5.87, p<0.05), disruption-cue and cue-test (F(2,172) = 9.694, p<0.001), microinjection and cue-test (F(2,172) = 22.936, p<0.001), and disruption-cue and microinjection and cue-test (F(2,172) = 6.172, p<0.01). In the two vehicle-treated control groups (‘S+ & vehicle’ and ‘S- & vehicle’), the bidirectional modulation of lever-pressing by S+ or S- was evident (p<0.01–0.001). In the group that received Daun02 following exposure to S+ (‘S+ & Daun02’), Daun02 disruption of IL neurons activated by S+ blocked the promotion of lever-pressing by S+ but spared the suppression of this behavior by S- (p<0.01). In the group that received Daun02 following exposure to S- (‘S- & Daun02’), Daun02 disruption of IL neurons activated by S- blocked suppression by S- but spared promotion by S+ (p<0.01). For all cases, basal lever-pressing initiated and maintained by active lever and light-cue was not significantly altered by Daun02 disruption of IL neurons activated by S+ or S- (see No S+/S-). Thus, Daun02 disruption of IL neurons activated by either S+ or S- exclusively altered the cue-modulation of reward seeking uniquely linked to the targeted cue in a single animal. Daun02’s effect on disrupting neural ensemble activity was verified by Fos immunohistochemistry (Figure 3) using previously established procedures (Koya et al., 2009b; Bossert et al., 2011; Pfarr et al., 2015). Each of the four groups prepared for the Daun02 disruption was further divided into three groups defined by the final Fos-induction conditions (‘S+’, ‘S-’ or ‘No S+/S-’). Each rat was subjected to one of these conditions. However, active lever and light-cue were not introduced in order to determine IL ensembles specifically reactive to S+ or S-. Three-way ANOVA on Fos-positive nuclei in IL revealed significant effects of microinjection (F(1,78) = 7.695, p<0.01), Fos-induction (F(2,78) = 31.129, p<0.001), and significant interactions for disruption-cue and Fos-induction (F(2,78) = 14.803, p<0.001), disruption-cue and microinjection and Fos-induction (F(2,78) = 11.016, p<0.001). In the two vehicle-treated control groups (‘S+ & vehicle’ and ‘S- & vehicle’), both S+ and S- significantly increased Fos-positive nuclei in IL (Ps < 0.05–0.01). In the group that received Daun02 following exposure to S+ (‘S+ & Daun02’), Daun02 disruption of IL neurons activated by S+ prevented the induction of Fos by S+ but spared the induction by S- (p<0.05). In the group that received Daun02 following exposure to S- (‘S- & Daun02’), Daun02 disruption of IL neurons activated by S- significantly reduced the induction of Fos by S- but spared the induction by S+ (p<0.05). Thus, Daun02 disruption of IL neurons activated by either S+ or S- exclusively altered the cue-triggered neural activation uniquely linked to the targeted cue in a single animal. Neural ensembles in IL reactive to S+ or S- following the activity-targeted disruption by Daun02. Each of the four experimental groups, prepared and used for the Daun02 disruption (Figure 2B) and Post-disruption tests I (Figure 2C), was further randomly divided into three groups defined by the type of final Fos induction condition (S+, S- or No S+/S-). The rats were exposed to S+, S- or No S+/S- (control), then deeply anesthetized and euthanized. Brains were collected, sectioned (40 µm), processed for Fos immunohistochemistry. Fos-positive nuclei from sampling areas around the IL microinjection sites were quantified double-blindly. The average numbers of Fos-positive nuclei per mm2 were calculated for each rat, and used for statistical analyses. Yellow arrows represent typical Fos-positive nuclei. Group means of these average numbers (+SEM) are depicted. N = 7–9, each. *p<0.05–0.01 (vs. No active lever/light-cue). Together with a recent electrophysiological report (Moorman and Aston-Jones, 2015), our findings establish that the same IL brain area is capable of controlling both promotion and suppression of reward seeking via different neural ensembles, each selectively reactive to S+ or S-. Because Daun02 disruption of IL neurons activated by either S+ or S- exclusively altered the behavioral response (Figure 2) as well as neural activation (Figure 3) uniquely linked to the targeted cue, mutually exclusive rather than overlapping neural ensembles in IL likely mediate the bidirectional environmental control of reward seeking. As is the case of recent studies that utilized similar activity-dependent procedures (e.g., Redondo et al., 2014; Grosso et al., 2015), the current results demonstrate the functional significance of manipulating brain cells based on their activity in addition to other characteristics, such as locality and phenotype. We thus raise caution to the use of non-selective techniques that manipulate neural activity irrespective of intrinsic neural activity for determining the brain behavioral functions. Finally, our findings provide the causal evidence for the concurrent existence of multiple engrams, each mediating different and even opposing environmental actions on a behavior, in a single brain area. In light of recent studies implicating differential brain processes in differential environmental control of a learned response (Ciocchi et al., 2010; Trouche et al., 2013; Adhikari et al., 2015), ensemble-specific neural phenotype as well as both local and brain-wide neurocircuitry involving each unique engram should be elucidated in future studies. A total of one hundred nineteen male Fos-lacZ transgenic rats (Kasof et al., 1995) on a Sprague-Dawley background were used (RRID:SCR_014785). Of which, a total of ninety rats were retained for statistical analyses (see below). This transgenic strain is required for neural activity-targeted disruption of neural ensembles by Daun02 pharmacogenetic inactivation (Koya et al., 2009b). All rats were bred at The Scripps Research Institute, and genotyped by Laragen, Inc. (Culver City, CA). The rats were group-housed (two rats per cage) in plastic cages in a temperature- and humidity-controlled room, maintained on a 12 hr/12 hr reverse light/dark cycle (lights on at 20:00 hr). At all times, the rats were allowed free access to food and water. All Fos-lacZ rats (250–300 g) were surgically implanted with permanent bilateral guide cannulae (22 G; Plastics One, Roanoke, VA, USA) under isoflurane anesthesia for the microinjection of Daun02 or vehicle (see below) into the infralimibic cortex (IL). The microinjection coordinates were anteroposterior + 3.2 mm, mediolateral ± 0.6 mm, dorsoventral −5.5 mm. Rats were allowed to recover at least seven days before the start of the behavioral procedures (see below). One rat died during the surgery, and five rats died due to post-operation complications. We developed an animal model for the bidirectional modulation of reward seeking by discriminative stimuli predictive of reward availability (S+) and reward omission (S-). General schematics and timeline are depicted in Figure 4. This model consisted of twelve experimental phases and lasted over six months. The rats were always trained and tested during the dark (active) phase in a dedicated operant conditioning chamber (‘chamber’) equipped with two retractable levers (one ‘active lever’ and one ‘inactive lever’), a ‘light-cue’ and a drinking well. At all times, insertion of both active and inactive levers signaled the start of a once daily operant conditioning session conducted under a fixed ratio 1 schedule of reinforcement. During this session, a press on the active lever resulted in a single delivery of 0.2 ml of either sweet solution containing 3% glucose and 0.125% saccharin dissolved in water (‘glucose & saccharin’) or plain water (‘water’) into the drinking well. In our pilot experiments (data not included), this combination of glucose and saccharin produced more robust operant responding than solutions containing either glucose or saccharin alone. Each delivery of either sweet solution or water was paired with 5s illumination of the light-cue signaling a 5s time-out period. During the 5s time-out period, presses on the active lever were recorded but without a scheduled consequence. At all times, presses on the inactive lever were recorded but without a scheduled consequence. Throughout the course of this model, the rats were repeatedly subjected to habituation periods (both between-sessions and within-sessions) in order to minimize the neurobehavioral impact of environmental cues (e.g., experimenters and chambers) other than those manipulated experimentally (i.e., active lever, light-cue, S+ and S-). Three different cohorts of rats were subjected to the entire behavioral procedure (i.e., three biological replicates). Experimental time course and schedule. The aim of this phase was to minimize the neurobehavioral impact of environmental cues other than those manipulated experimentally. All rats were placed in the chamber daily for 180 min without a scheduled consequence. The aim of this phase was to establish appetitive operant responses in each animal. All rats were trained daily to lever press for the sweet solution in once daily sessions. The rats were placed in the chamber and habituated for 30 min. Insertion of both active and inactive levers then marked the start of a 60 min session to self-administer glucose and saccharin. A press on the active lever delivered the sweet solution, and also illuminated the light-cue. Each rat was required to satisfy two pre-set training criteria: a minimum of five weeks of training (35 sessions), and a minimum of 100 deliveries of the sweet solution for three consecutive sessions. Three rats that did not satisfy these criteria within six weeks of training were excluded. During this phase, the insertion of the active lever and the illumination of the light-cue predicted the availability of the sweet solution 100% of the time. The aim of this phase was to establish discriminative stimuli predictive of reward availability (S+) and reward omission (S-) in each animal. All rats were trained daily to recognize two types of auditory cues (white noise and beeping tone) as S+ and S-. The assignment of white noise and beeping tone as S+ or S- was counterbalanced between subjects. Each rat was subjected to alternating once daily sessions to self-administer the sweet solution (preceded and accompanied by the S+ auditory cue) or water (preceded and accompanied by the S- auditory cue). The rats were placed in the chamber and habituated for 30 min. One of the auditory cues was then introduced starting 30 min prior to the insertion of both levers, and maintained throughout a 30 min session to lever press for either the sweet solution or water. 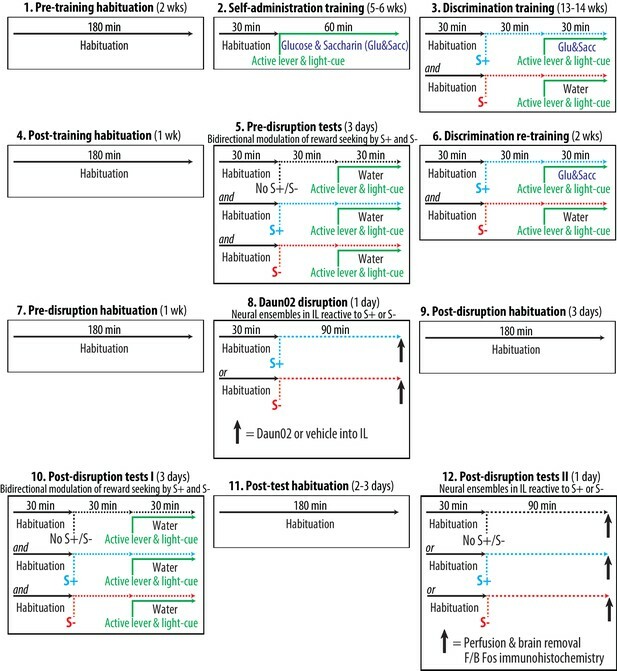 Each rat was required to satisfy three preset training criteria: a minimum of 13 weeks of training (i.e., 46 S+ sessions and 46 S- sessions), a minimum of 50 deliveries of the sweet solution for three consecutive S+ sessions, and a maximum of five deliveries of water for three consecutive S- sessions. Nine rats that did not satisfy these criteria within 14 weeks of training were excluded. During this phase, each experimentally manipulated stimulus was conditioned to predict the sweet solution at varying probability: active lever and light-cue (50%), S+ (100%) and S- (0%). The aim of this phase was to establish the baseline measurements of the bidirectional modulation of reward seeking by S+ and S- in each animal. All rats were tested daily for the bilateral environmental modulation of reward seeking. Each rat underwent three once daily cue-tests:  active lever and light-cue without S+ or S- (No S+/S- test),  active lever, light-cue and S+ (S+ test),  active lever, light-cue and S- (S- test). The order of these conditions was randomly counterbalanced between subjects. For all cue-tests, a press on the active lever delivered water and illuminated the light-cue. The sweet solution was not available. For the No S+/S- test, each rat was placed in the chamber and habituated for 60 min. Insertion of both active and inactive levers then marked the start of a 30 min cue-test. Neither S+ nor S- was introduced. For the S+ test, each rat was placed in the chamber and habituated for 30 min. The S+ auditory cue was then introduced starting 30 min prior to the insertion of levers, and maintained throughout a 30 min cue-test. For the S- test, each rat was placed in the chamber and habituated for 30 min. The S- auditory cue was then introduced starting 30 min prior to the insertion of levers, and maintained throughout a 30 min cue-test. The aim of this phase was to establish discriminative stimuli predictive of reward availability (S+) and reward omission (S-) in each animal. All rats were re-trained daily for S+ and S- following the experimental schedules effective during the discrimination training. The aim of this phase was to permanently disrupt IL neurons selectively reactive to S+ or S- in different animals. Neural ensembles in IL reactive to S+ or S- were permanently disrupted (lesion by apoptosis) by Daun02 pharmacogenetic inactivation technique (Koya et al., 2009b; Pfarr et al., 2015). The rats were randomly assigned to one of four experimental groups defined by disruption-cue (two levels: S+ or S-) and microinjection (two levels: Daun02 or vehicle). All rats were placed in the chamber and habituated for 30 min. The disruption cue (S+ or S-) was then introduced. The rats remained in the chamber for additional 90 min in the presence of S+ or S-. This timing (90 min) was to optimally induce β-galactosidase and Fos in neurons activated by either S+ or S- (Koya et al., 2009b). In order to disrupt the neurons specifically activated by S+ or S-, both levers and light-cue were not introduced, and thus the rats were withheld from lever pressing. The rats then received a bilateral microinjection of Daun02 (2.0 µg/0.5 µl/side) or vehicle (0.5 µl/side) into IL, and returned to their homecages. The Daun02 disruption was based on previously published procedures (e.g., Koya et al., 2009b; Bossert et al., 2011; Pfarr et al., 2015). We purchased Daun02 (Farquhar et al., 2002) from Sequoia Research Products (Pangbourne, Berkshire, UK: Cat# SRP0400g). The aim of this phase was to determine the behavioral impacts of Daun02 disruption of IL neurons reactive to S+ or S- on the bidirectional modulation of reward seeking by S+ and S-. The effects of Daun02 disruption of IL ensembles on the bilateral modulation of reward seeking by S+ and S- were determined. Each rat was again subjected to the once daily three cue-tests following the experimental schedules effective during the pre-disruption tests. The aim of this phase was to confirm Daun02 disruption of IL neurons specifically reactive to S+ or S-.The rats were prepared and euthanized for the histological verification of Daun02 disruption of IL ensembles. Each of the four experimental groups – prepared for Daun02 disruption and post-disruption tests I – was further randomly divided into three groups (N = 7–9, each, retained for statistical analyses) defined by the type of final Fos-induction condition (three levels: ‘S+’, ‘S-’ or ‘No S+/S-’). All rats were first placed in the chamber and habituated for 30 min. The rats remained in the chamber for additional 90 min in the presence of the S+ auditory cue, the S- auditory cue or no additional stimulus (No S+/S-). In order to determine the IL ensembles specifically reactive to S+ or S-, both levers and light-cue were not introduced, and the rats were thus withheld from lever pressing. The rats were then deeply anesthetized with isoflurane and intracardially perfused with 100 ml of 1× PBS followed by 200 ml of fixative solution (phosphate buffer, containing 4% paraformaldehyde and 14% saturated picric acid). Brains were collected, postfixed for 24 hr at 4°C in fixative solution and sectioned (40 µm). The brain sections harvested from all animals were processed for Fos immunohistochemistry and quantified as described previously (e.g., Koya et al., 2009b; Bossert et al., 2011; Pfarr et al., 2015). Fos antibody (1:2000 dilution) from Cell Signaling Technology (Cat# 2250S, Danvers, MA, USA; RRID: AB_2247211) was used. The sections were developed using an ImmPRESS HRP (Peroxidase) Polymer Kit from Vector Laboratories (Cat# MP-7451, Burlingame, CA, USA; RRID:AB_2631198) and diaminobenzide. β-galactosidase antibody (1:1000 dilution) from Santa Cruz Biotechnology (Cat# sc-65670, Dallas, TX, USA; RRID:AB_831022) was used. Additional brain sections were processed for X-gal (5-bromo-4-chloro-3-indolyl β-D-galactopyranoside) histochemistry to validate the presence of β-galactosidase as described previously (e.g., Koya et al., 2009b; Bossert et al., 2011; Pfarr et al., 2015). We purchased X-gal kit (Cat# XGAL-0100;) from Rockland Immunochemicals Inc. (Pottstown, PA). The histological validation of Daun02 disruption was based on previously published procedures (e.g., Koya et al., 2009b; Bossert et al., 2011; Pfarr et al., 2015). Bright-field images of IL were captured and digitized using EVOS microscope (ThermoFisher, Inc., Waltham, MA, USA). These images were used for (1) histological verification of the co-localization of Fos and β-galactosidase (i.e., Fos-lacZ positive), (2) histological verification of the microinjection sites, and (3) histological quantification of Fos-expressing nuclei. Nuclei expressing Fos and/or β-galactosidase were counted using ImageJ (National Institute of Health, Bethesda, MD, USA; RRID:SCR_003070). The threshold level was set to detect moderate to darkly stained nuclei but not lightly stained nuclei. We counted nuclei from sampling areas around the IL injection site from 3–5 coronal sections per rat. Average numbers of Fos-positive nuclei per mm2 calculated for each rat were used for statistical analyses and data representations. Image capture and quantification were conducted by an observer blind to the experimental conditions. One rat was determined to be Fos–lacZ negative (no co-localization of Fos and β-galactosidase), and excluded. Seven rats were excluded because their microinjection sites were determined to be outside of IL. Three rats were excluded due to necrosis in tissues surrounding the microinjection sites. We did not use a power analysis to predetermine sample sizes. However, our sample sizes are similar to those reported in previous publications. We used non-parametric statistical methods to reduce the effect of the small sample size. The behavioral results from the pre-disruption and post-disruption tests I were analyzed separately. For each test, the total numbers of active lever presses recorded during the 30 min lever-pressing session were used. For the pre-disruption tests, the statistical analyses were conducted using one-way within analysis of variance (ANOVA) with cue-test (three levels: S+, S- and No S+/S-) as within-group factor. For the post-disruption tests I, the statistical analyses were conducted using two-way between and one-way within ANOVA with disruption-cues (two levels: S+ or S-) and microinjection (two levels: Daun02 or vehicle) as between-group factors and cue-test (three levels: S+, S- and No S+/S-) as within-group factor. For the post-disruption tests II, the average numbers of Fos-positive nuclei per mm2 were calculated for each animal and used for statistical analyses. These analyses were conducted using three-way between ANOVA with the type of disruption-cue (two levels: S+ or S-), microinjection (two levels: Daun02 or vehicle) and Fos-induction (three levels: S+, S- or No S+/S-) as between-group factors. For all cases, Tukey test was used for post-hoc group comparisons when appropriate. Effects were considered significant when p<0.05. We used IBM SPSS Statistics (IBM, Armonk, NY, USA; RRID:SCR_002865) and Sigma Plot (Systat Software, San Jose, CA, USA; RRID:SCR_003210) for conducting statistical analyses. Cancer Chemotherapy and Pharmacology 50:65–70. European Journal of Neuroscience 35:614–622. Philosophical Transactions of the Royal Society B: Biological Sciences 369:20130161. European Journal of Neuroscience 37:259–268. Thank you for submitting your article "Distinct memory engrams in infralimbic cortex control opposing environmental actions on behavior" for consideration by eLife. Your article has been reviewed by two peer reviewers, including Steve Ramirez (Reviewer #1), and the evaluation has been overseen by a Reviewing Editor and Timothy Behrens as the Senior Editor. This is an exciting paper that uses cutting-edge pharmacogenetic and behavioral techniques to assess the role of infralimbic (IL) neuronal populations in mediating opposing environmental actions (i.e. reward availability and omission) on behaviour (e.g. promotion and suppression of reward seeking). The authors bi-directionally modulate reward-seeking behaviour by identifying and inactivating IL neurons previously active either during reward availability of omission. They further show that cells in the IL increase their activity in response to both reward availability and omission cues, and they go on to successfully inactivate these ensembles to block cue-specific increases in neuronal activity. Overall, the experiments are well thought out, the paper is well written, and I view the current manuscript as an outstanding bridge between cells that differentially process discrete experiences and their causal contributions to reward seeking behaviour. 1) If a control group in which a random set of cells of equal ensemble size (i.e. ~70 Fos-positive nuclei per mm2) is inactivated and the rats fail to show changes in lever-presses, then this result would greatly strengthen the claim that cells active during reward availability/omission per se are directly involved in modulating each behaviour. This experiment is important because an alternative interpretation of the data is that modulating any ensemble of equal size might thereby lead to behavioural changes in lever pressing without having to be directly tied to a defined c-Fos-inducing experience. I appreciate that this type of experiment has been performed previously (e.g. Koya et al. 2009) and, at the very least, warrants a brief discussion in the manuscript to convincingly argue that the behavioral perturbations observed are in fact tied directly to c-Fos-expressing cells during a defined epoch of time. 2) Are cells active during S+ or S- preferentially reactivated during S+ or S- presentations, respectively? This experiment would provide a positive control to demonstrate the "upper bounds" of S+ or S- induced reactivation of a defined set of IL cells and can be performed by first inducing β-gal expression in cells active in response to S+ or S-, followed by administering S+ or S- the following day and sacrificing the animals 1.5 hours later to measure β-gal and c-Fos overlap levels. These data would compliment the authors' data in in Figure 3 in which they demonstrate that they can block the S+ or S- induced increases in IL activity with Daun02-mediated inactivation of these cells. This is an important question regarding whether the observed effects of Daun02 on the bidirectional modulation of reward seeking by S+ and S- are due to the “quality” (those specifically activated by either S+ or S-) or “quantity” (any population of ~70 Fos-positive nuclei per mm2) of IL neurons that were selectively disrupted by Daun02. We have now clarified the issues raised here in the main text. In short, we believe that the original experimental design and results already provided sufficient evidence to reject the alternative interpretation that “modulating any ensemble of equal size might thereby lead to behavioural changes in lever pressing without having to be directly tied to a defined c-Fos-inducing experience”. More specifically, we believe that a sufficient internal control to address the quality vs. quantity question was already implemented in the original study. In the current study, each animal was trained to recognize three sets of cues predictive of rewards at varying probability (Figure 1): active lever and light-cue (50%), S+ (100%) and S- (0%). In different animals, Daun02 was then used to selectively disrupt neurons specifically activated by S+ or S-. In the group of animals that received Daun02 into IL following exposure to S+, Daun02 disruption of “S+ activated” neurons blocked the promotion of reward seeking (Figure 2C) as well as neural activation (Figure 3) by S+, but spared the suppression of this behavior (Figure 2C) as well as neural activation (Figure 3) by S-. In the group of animals that received Daun02 into IL following exposure to S-, Daun02 disruption of “S- activated” neurons blocked the suppression of reward seeking (Figure 2C) as well as neural activation (Figure 3) by S-, but spared the promotion of this behavior (Figure 2C) as well as neural activation (Figure 3) by S+. Importantly, Daun02 disruption of IL neurons activated by either S+ or S- did not significantly alter basal reward seeking due to active lever and light-cue (Figure 2C). Taken together, Daun02 disruption of IL neurons activated by either S+ or S- exclusively altered the behavioral response (Figure 2) as well as neural activation (Figure 3) uniquely linked to the targeted cue – thus establishing that the observed effects were due to the quality rather than quantity of neurons selectively disrupted. We thus believe that the current results sufficiently confirm that “the behavioral perturbations observed are in fact tied directly to c-Fos-expressing cells during a defined epoch of time (exposure to S+ or S-)”. In addition, we would like to mention that the current results are in line with our previous findings that the quantity of cells silenced by Daun02 is not the critical factor behind Daun02’s effects on disruption of learned behaviors. For example, in rats with cocaine self-administration experience, exposure to novel contexts induces 3-fold more accumbens Fos than an exposure to a cocaine context. Yet, Daun02 disruption of neurons activated only by the cocaine context (but not novel context) disrupts context-induced reinstatement of cocaine-seeking (Cruz et al., J Neurosci 2014, 34: 7437–7446). Distinctively tagging S+ or S- activated neurons in the same Fos-lacZ rat requires the time-course of β-gal and cFos expression to be sufficiently distinct. In a pilot study leading up to the original publication of the Daun02/Fos-lacZ method (Koya et al. 2009, Nat Neurosci, 12: 1069-73), we found that this was not the case: the time-course of β-gal and cFos expression was very similar. Thus, unfortunately, the experiment suggested here is not technically possible in Fos-lacZ rats. Moreover, to our knowledge, no method currently exists to distinctly tag separate neuronal ensembles in rats. While such methods do exist for mice (e.g., TetTag mice, Reijimers et al., 2007, Science, 317:1230-3), replicating the current experiments in mice will be beyond the reasonable scope of the current study. However, we fully agree that this is an important issue that needs to be systemically addressed in a future study. Nevertheless, based on the current results (Figures 2 and 3), we speculate that a significant extent of the neuronal ensembles recruited by S+ and S- are mutually exclusive rather than overlapping. We thus believe that the answer to the question raised here (“Are cells active during S+ or S- preferentially reactivated during S+ or S- presentations, respectively?”) is “yes”. We have now clarified these issues in the main text. This is publication number 29442 from The Scripps Research Institute. We gratefully thank Dr. Jennifer M Bossert (NIDA/NIH/IRP) for her technical support in immunohistochemistry. This work was supported by the Extramural and Intramural funding from National Institute on Drug Abuse as well as National Institute of Alcohol Abuse and Alcoholism, National Institute of Health, USA: R21DA033533 (NS), R01DA037294 (NS), R01AA023183 (NS), R01AA021549 (FW) and ZIADA000467 (BTH). AL was supported by Ruth L Kirschstein Institutional National Research Service Award from National Institute of Alcohol Abuse and Alcoholism, National Institute of Health, USA: T32AA007456. AL was supported by Ruth L. Kirschstein Institutional National Research Service Award from National Institute on Alcohol Abuse and Alcoholism, National Institute of Health, USA: T32AA007456. Animal experimentation: All experimental procedures were conducted in adherence to the National Institutes of Health Guide for the Care and Use of Laboratory Animals and were approved by the Institutional Animal Care and Use Committee of The Scripps Research Institute. (animal protocol #12-0032). © 2016, Suto et al.